"When I choose to play a composer or a work, it's always the same thing: it goes with goosebumps, it goes with work that speaks to my heart. I always see the choice of my repertoire with no limit. Different eras, different composers, different styles. That's the way music has always been in my life, and that's the way I want to share it." Violinist Angele Dubeau is not alone in getting goosebumps from this piece, "Summa" by Arvo Part. It's the first piece of his that she ever heard, and she knew right away that she wanted to start her new CD with the work. "Listening to 'Summa,' you go and you find these few elements, these very primitive materials," says Dubeau. "The texture and the color are very very important. Just like a painter, to take the color of a palette and put it into sound." I was secretly delighted to hear Angele say this, as the first time I listened to Arvo Part with my husband, an artist, he said, "Whoa. This guy is a PAINTER." You can hear the brush strokes, and the layering of colors--opaque here, translucent there. And throughout, says Dubeau, is a sense of absolute calm. "First you have to step back from personal emotion and you have to make room for that sense of calm, to let the music uplift you," she enthuses. "It's strange, because when you look to the music of Arvo Part, it's such simple elements but it becomes very very strong, and it's a music that finds a direct way to the listener, that's for sure." And reaching listeners is what Angele Dubeau is all about. "I studied for 3 years in Romania and I listened to a lot of gypsy music, violinists who were expressing themselves with their instrument," she recalls. "That's where I realized that a violin can speak, a violin can cry, a violin can dance. From then on, that's what I wanted to do. I wanted to make my instrument speak to the people." 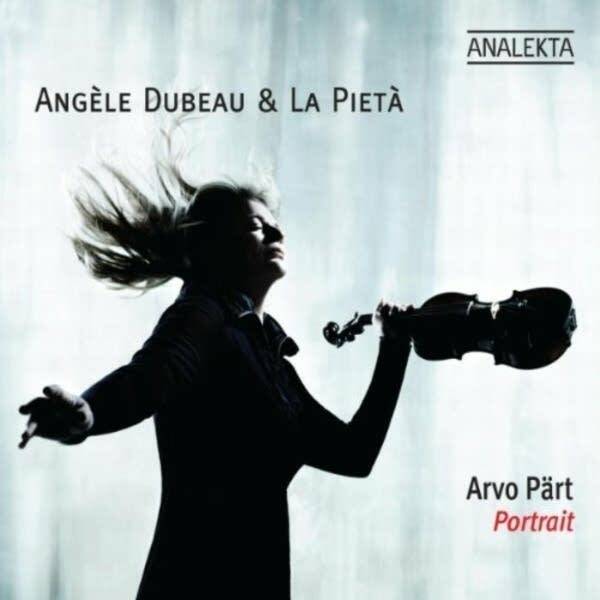 Arvo Part is deeply religious and many of his works are devotional in nature, but Dubeau says his music touches people in a way that transcends religion. "It's just like when you enter a cathedral, whatever your beliefs are, you have deep inside you the sense of contemplation, the sense of serenity or respect, a mix of this. The music of Arvo Part, it's just like entering a cathedral for me." "Discovering this music," she continues, "was just a new musical language that I was going into... to see those little notes, just ringing like church bells. And what I've found in this music is that every note is telling. The notes are there, they are like jewels, and they all mean something. Less definitely means more." "Part is giving me a voice, is giving me a frame of music, with that character, with that sense of serenity, I go into it," she says. But her affinity with Part's music is not just one of adoration. It goes both ways, with Dubeau finding thrilling ways to complement and creatively build on the composer's work. "The music is giving the cathedral. Arvo Part is a cathedral," she reiterates. "And when I play, I fill that cathedral." Valerie Kahler grew up in a musical family and started playing cello and piano in 3rd grade.